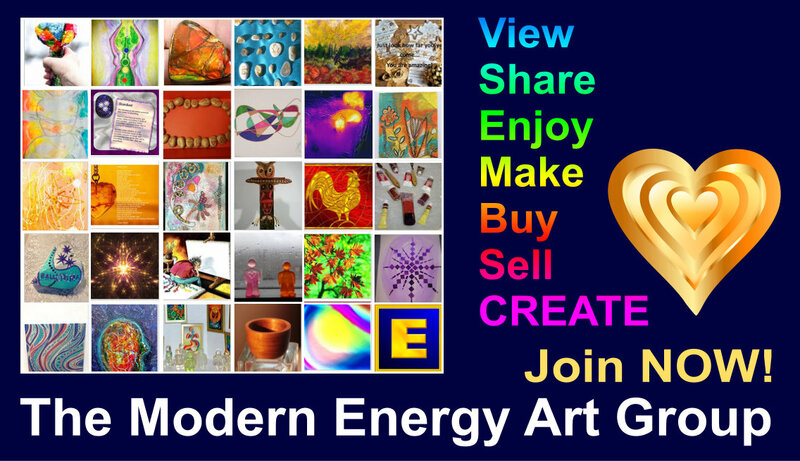 So, I need business cards for the forthcoming art exhibition. Moo.com was suggested and it seems so reasonable, so for the second time I went there and started the process. For the second time, I lost my will to live. I need "Silvia Specials." I'll have to make them myself. Immediately, life, love of life and love of art returned and with it, sparkling excitement on this sunny Sunday morning. 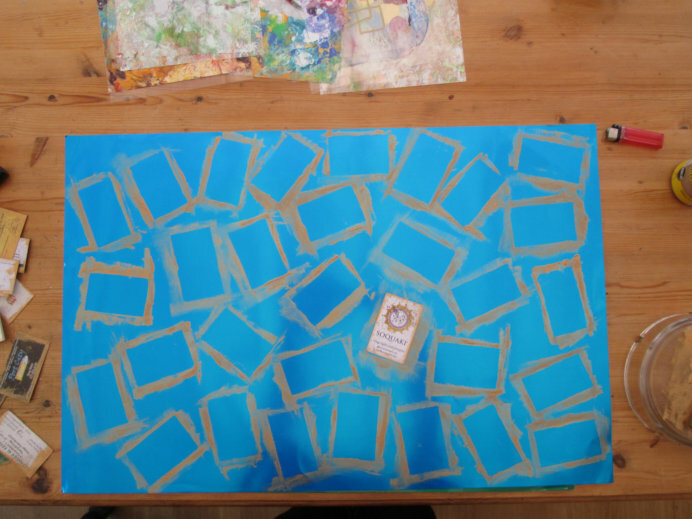 Now I had an idea of cutting up a painting and using that, and a fellow artist from the FB art group send me to a blog of a friend of hers, who had done just that for Christmas cards. I took one look and didn't like it for my purposes. 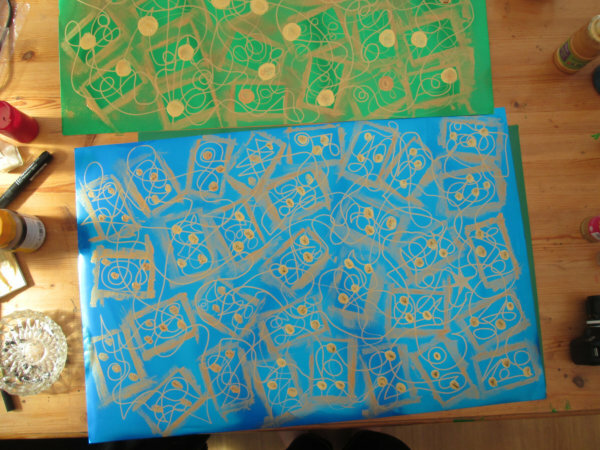 I don't like the idea of cutting up any of my paintings, they're not ... gift wrap. 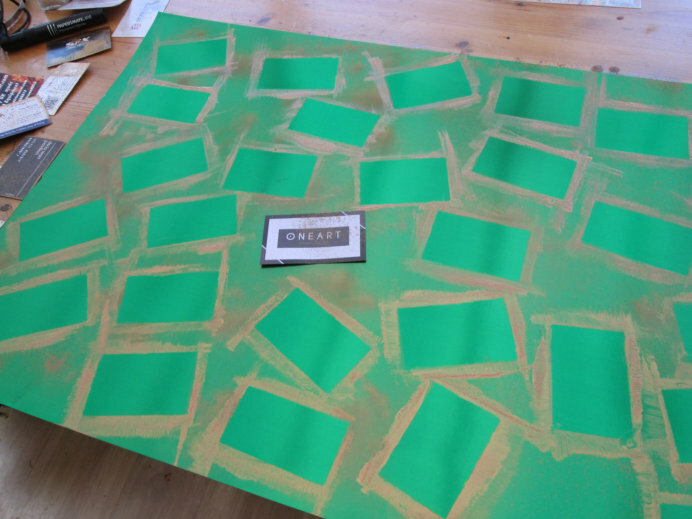 I contemplated creating a painting for the very purpose of cutting it up. That felt slightly better but I still didn't quite get that click, that flash, that lets me know I'm on the right path. As it so happens, I have a lot of art card (from the art shop purchase) so I got a sheet of that. Nice and sturdy and laminated on one side, the sheet was a good starting point. I put it on the kitchen table. Now, what size is a business card? I got my wallet and got out all the business cards in there and that's when things started to take off. I knew what to do and I also became much, MUCH clearer on what I was doing and why. What exactly are "business cards"? They're little ambassadors as to who you are. "Fly, my pretties, fly ..."
If they're created by an energy magician or they come from a person you really want in your life (or both! LOL) you keep them and they are precious to you. Not about advertising or marketing at all. The original idea was using a spray can to create their "ghostly outlines." Sadly, the gold spray spluttered and died. 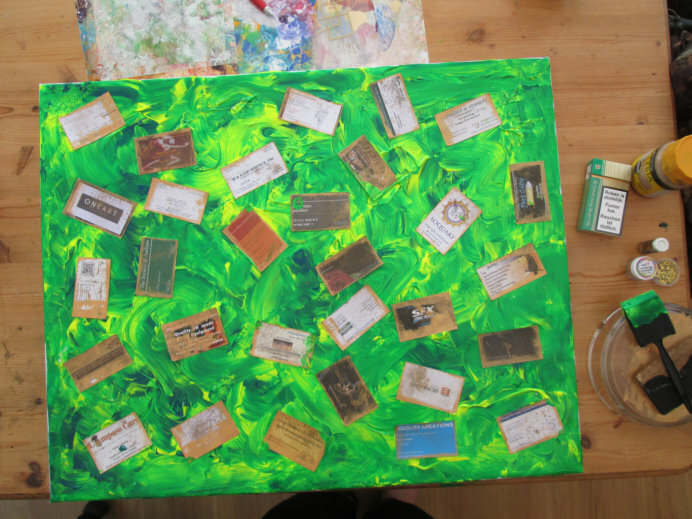 And that was so much fun, I thought I'd do a second one, for a full set of about 50 "business cards." 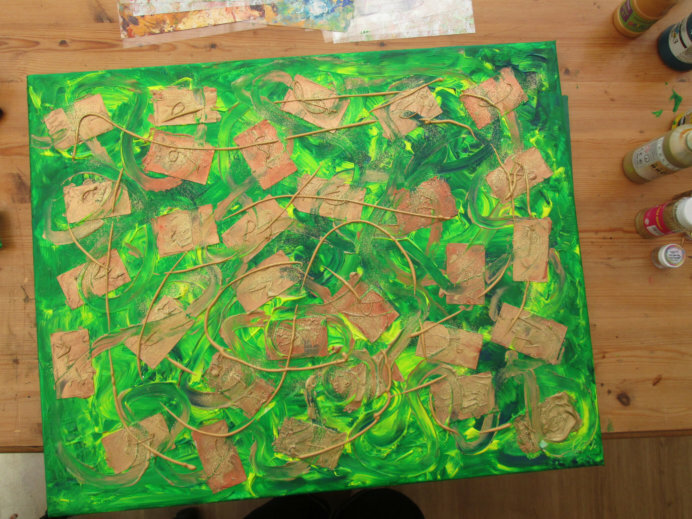 So they're now drying, and what I will do is to make two really connected Symbol Painting lines across. Perhaps more paint will be involved, don't know that yet, but then and when they're dry, I'll cut them out by hand and sign them on the back. And they'll all be connected! 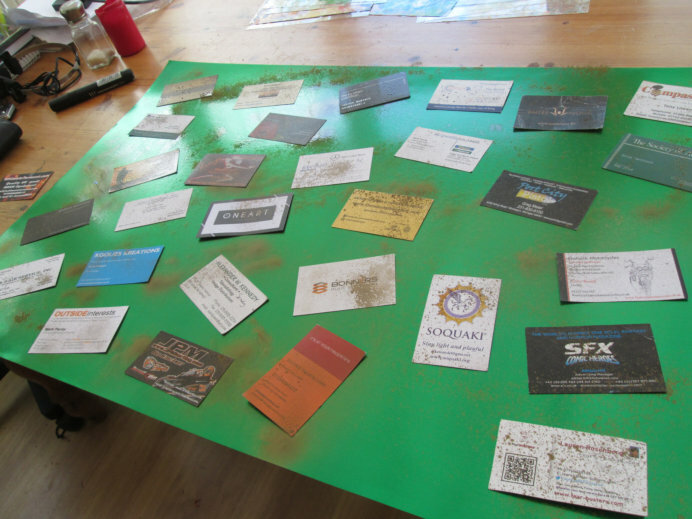 I had a lot of other people's business cards (all of which are in my address book, in my phone, on skype, on FaceBook!) now sitting there, with gold on them. No way I'm going to throw those away! 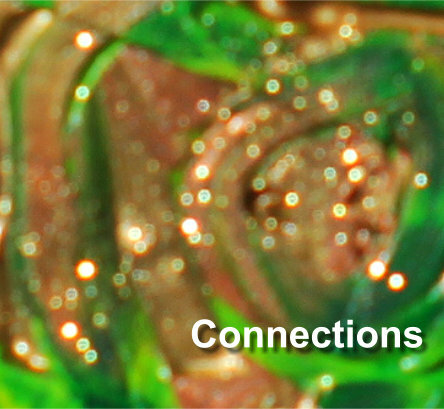 They've been lovely messengers, helpful, they are *connections* - how can I celebrate them and activate this whole deal? That's a canvas with a lot of paint and all the business cards from my wallet on it. First, I coated them all in gold. Then I drew with my finger the connections into the wet paint. Then I added more connections with the gold paint straight from the tube. 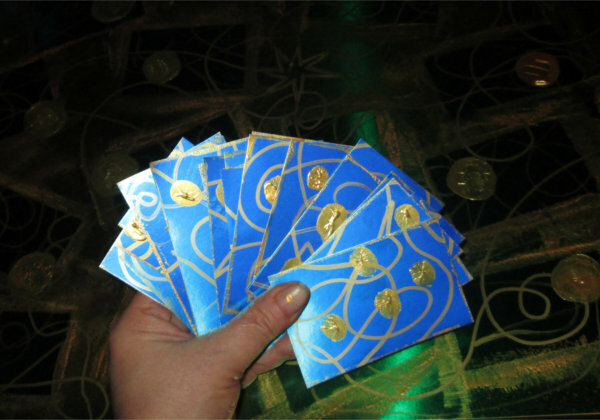 Then I brought out the gold glitter and "let the love fall where it will" - but always radiating out from the centre of each card. And there we have it - a wonderful process, a wonderful "work of art" that is literally dancing in the sunlight and now needs to dry slowly. 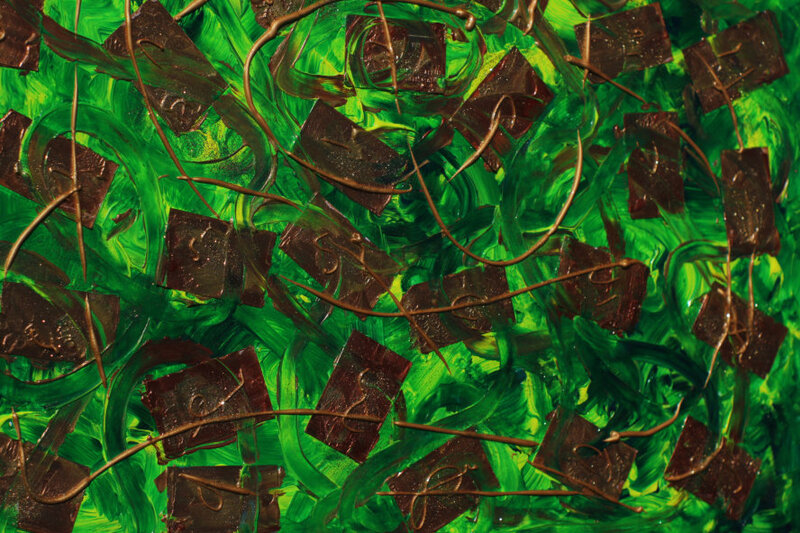 Meet "Connections" Acrylics, Gitter and Business Cards on Canvas, April 13, 2014! And here are the "no moo" business cards. I'll put the name of my website on the back 1-art.eu and write my name and a personal message on the day when I hand them over.